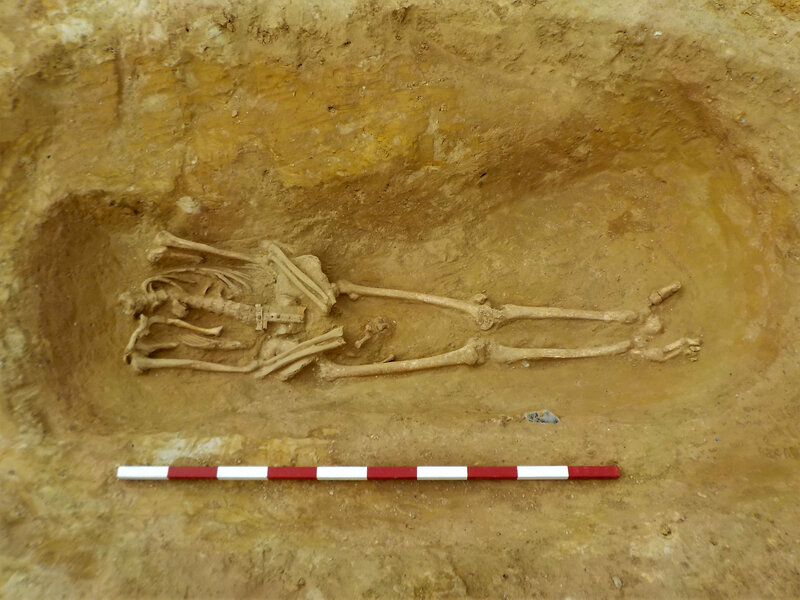 Archaeologists have discovered a Roman cemetery with an unusual number of decapitation burials in Suffolk. The skeletal remains of 52 individuals, men, women and children, were unearthed. About 40 percent of the burials found — including two ten-year-old children — had been decapitated and their heads deliberately placed between their feet or at their sides. The team was excavating the site of a new housing development in Great Whelnetham, near Bury St Edmunds, known to have been a Roman settlement of the 3rd century A.D. 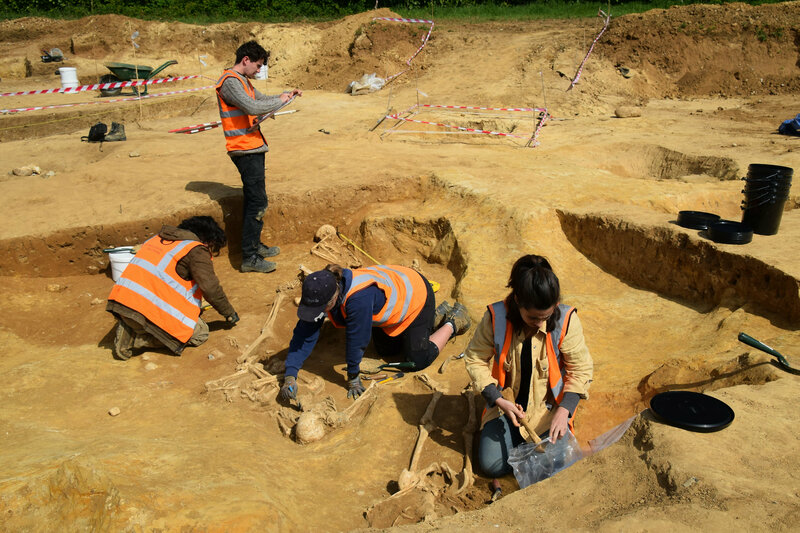 The area has fine, sandy soil, a very poor preservation medium for organic remains, so they expected to find maybe the shadows of burials, the subtle impressions left in the ground after all of the bodies had disintegrated centuries ago. 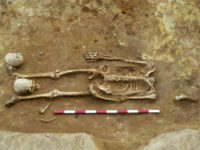 When the first exploratory trench revealed two largely intact skeletons, archaeologists were intrigued and widened the excavation to cover two large squares. The wide trenches were necessary because of that sandy soil. Usually cemetery finds can be excavated by focusing on the grave cuts which mark the spot of a burial better than any X can mark the spot of a fabulous pirate treasure. The grave cuts disappeared completely in this soil, so in order to excavate the entire cemetery, they had to dig up a lot of ground. The work paid off and dozens more skeletons in good condition were unearthed. 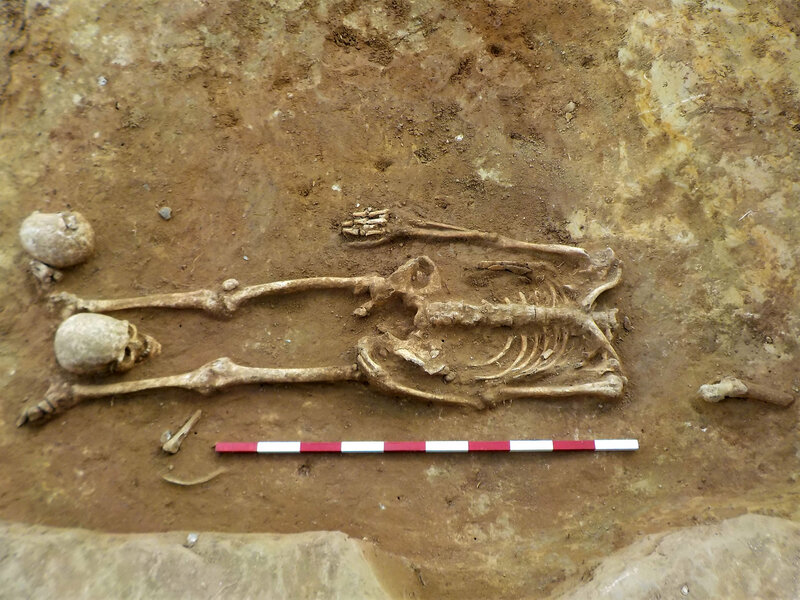 It’s extremely rare to find so many decapitation and otherwise non-standard burials in a Roman cemetery in Britain. Traditionally, the Romans buried their dead on their back, bodies intact and significant religious and personal items interred with them. Most Roman cemeteries contain a few unusual or deviant burials, often the result of executions or death from an illness that was considered dangerous to the living. Mr Peachey, from excavation company Archaeological Solutions, said the remains did not indicate executions. “This appears to be a careful funeral rite that may be associated with a particular group within the local population, possibly associated with a belief system (cult) or a practice that came with a group moved into the area,” he said. 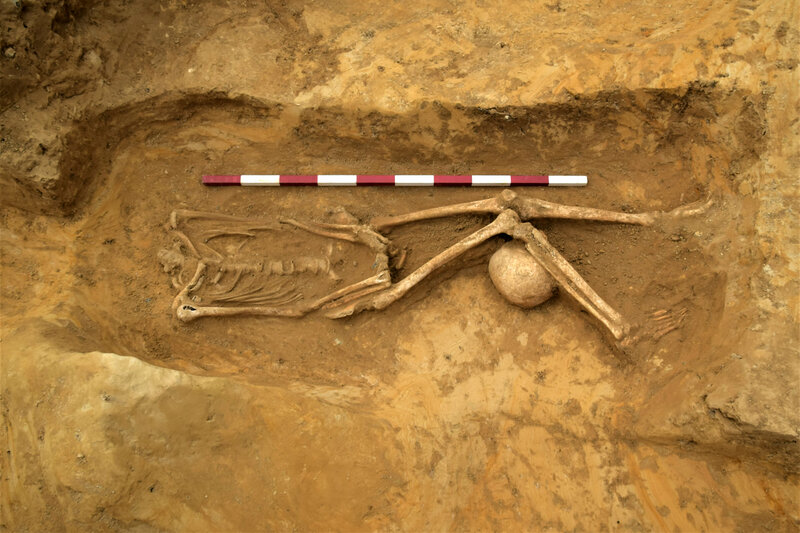 Less than a handful of burial grounds with such a high proportion of deviant burials have been discovered in Britain. The two other Roman cemeteries found in Great Whelnetham have the normal small proportion of deviant burials. Given that 60% of the burials in this cemetery deviate from the norm, the deviant largely was the norm for this community. Peachey speculates that it could have been a local cult, absorbed like so many were by the Romans, that venerated the head as the locus of the soul, perhaps, or reserved it special treatment for some other reason. The other possibility, that these were a sub-group of the population who moved to Britain and brought their funerary traditions with them, may be confirmed or denied by staple isotope analysis of their teeth. It can pinpoint where people lived as children. If it does turn out that they came from some far-flung area of the Empire, that opens up the possibility that they were slaves, an imported agricultural labour force. Osteological analysis has found that they were, as a group, healthy, well-fed and well-doctored. A few children died young, but there were more adults in what we would consider middle age and older. They were well-built with muscular arms and upper body and had no signs of malnutrition. They even had bad teeth indicating they had easy access to sugars and carbohydrates, the downfall of dental hygiene since time immemorial, but all the abscesses, lesions and areas of lost/extracted teeth were well-healed. The results of the analyses will take at least six months. The remains have been moved to a museum laboratory for further study. When the report is complete, it will be published and all remains and artifacts deposited in the Suffolk County Council archaeological archive. This entry was posted on Thursday, January 10th, 2019 at 9:48 PM	and is filed under Ancient. You can follow any responses to this entry through the RSS 2.0 feed. You can skip to the end and leave a response. Pinging is currently not allowed. In 1327, the Great Riot occurred, in which the local populace led an armed revolt against the Abbey. The burghers were angry at the overwhelming power, wealth and corruption of the monastery, which ran almost every aspect of local life with a view to enriching itself. The riot destroyed the main gate and a new, fortified gate was built in its stead. However, in 1381 during the Great Uprising, the Abbey was sacked and looted again. This time, the Prior was executed; his severed head was placed on a pike in the Great Market. Pleasant spot to visit, mind. “…and they all had lovingly being laid their own heads in between their feet” Indeed, “true Romance“. a recent american public television show, “secrets of the dead,” talked about this kind of deviant burial. an oxford historian traveled to romania (or eastern europe) to find that many of these beheadings are post-mortem, and usually due to the beliefs of vampires. they would cut the heads of suspected vampires. but a group of vampires? likely not.